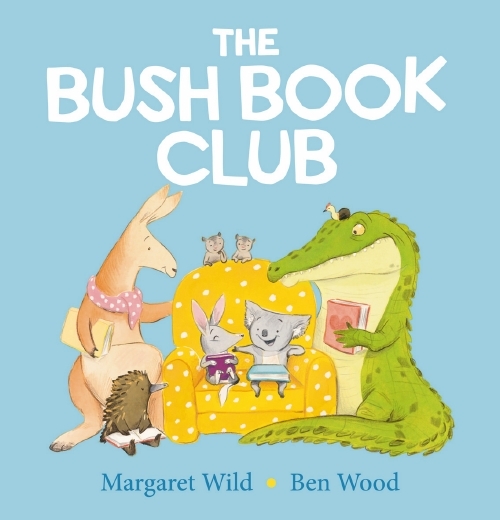 All the animals belong to the Bush Book Club and love to read. All except Bilby. He can’t stay still long enough to read a book, not when there are somersaults and cartwheels and handstands to do. What would it take for Bilby to slow down and look into a book? I was born in Melbourne, but grew up in South Gippsland in Victoria. My grandparents had a farm, so I spent much of my childhood having adventures on the farm. I now live in Sydney. I went to a small country school, and to get to school I had to walk through the bush! I was very creative! I drew all the time — even in Maths class! I got in trouble for it! The Wizard of Oz by Frank L. Baum. It is full of silly characters and places! Oh, what a hard question! I have so many favorites! Roald Dahl is one of my favourites now. That man knew how to write a funny story! I LOVE food! All food! I send most of the day talking about what I want to eat for lunch or dinner. My favorite foods would be spicy Mexican and Indian foods! YUM! My favourite movie is Jurassic Park. Dinosaurs are cool! When I was doing my VCE I was the only Year 12 student who wanted to study art. It was likely I’d have to go to another high school so I could! But my high school art teacher knew how important it was for me and taught me herself. I was able to stay at my high school because of her. She was a huge inspiration to me! After studying Graphic Design at university, I applied for a May Gibbs emerging illustrator mentorship program. I was taught about the world of children’s publishing, and was able to meet many very talented authors, illustrators and editors. It was a great experience that introduced me to the world. I’ve always loved stories! Reading, writing and drawing have always been my favourite things to do. Now, I get to do it as my job. I’ve always had a very creative imagination, but on the days that it is feeling a little flat, I look at artists I like, watch a movie, or I draw for fun! There are no rules when drawing for fun — I can do anything! I have a nice big studio with lots of natural light. I like to work in here, listening to the cockatoos flying around outside. They are loud! I get to create worlds. I get to work with amazing authors, and creative folk! I get to meet readers and writers, and talk about stories. It is fun! When I’m not illustrating a book, I am painting, drawing, and thinking of other creative projects I can do. My brain never stops! I also visit schools and run drawing and book-making workshops with students. I also read a lot of books, and love to play with my dog. Her name is Wombat!